Check out the news conference (video below) by the Virginia Hospital & Healthcare Association (VHHA), focusing on the importance of expanding access to healthcare (e.g., by expanding Medicaid) here in Virginia. Among others who spoke at the news conference in Richmond this morning were Julian Walker of VHHA, plus representatives from Sentara Healthcare, Valley Health, Mary Washington, and Augusta Health. For more background on this issue, see Virginia Hospital & Healthcare Association Launches Statewide Public Awareness Campaign and Virginia Hospitals Bend Over Backwards to Try to Bring Back Federal Health Care Dollars. And make sure you let your lawmakers know how important this is to you. Thanks. P.S. See press release below the video. Today, leaders from community hospitals across the Commonwealth spoke at a news conference in Richmond to highlight 2018 public policy priorities to improve our health care delivery system, including increased access to coverage for the uninsured, and to reveal new statewide poll numbers showing Virginia voters overwhelmingly support health care coverage for the uninsured. 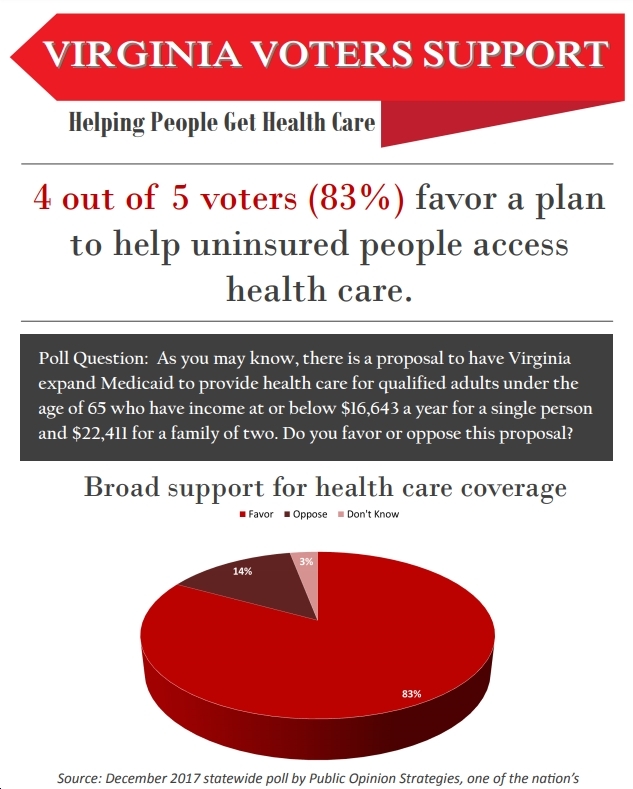 Four out of five Virginia voters (83 percent) support a plan to help enroll the uninsured in health care coverage. Across each region of the Commonwealth, at least 80 percent of voters support this idea. Support for health care access is strong across party lines with more than two-thirds of self-identified Republicans and Independents supportive, and more than nine out of 10 Democrats in favor. 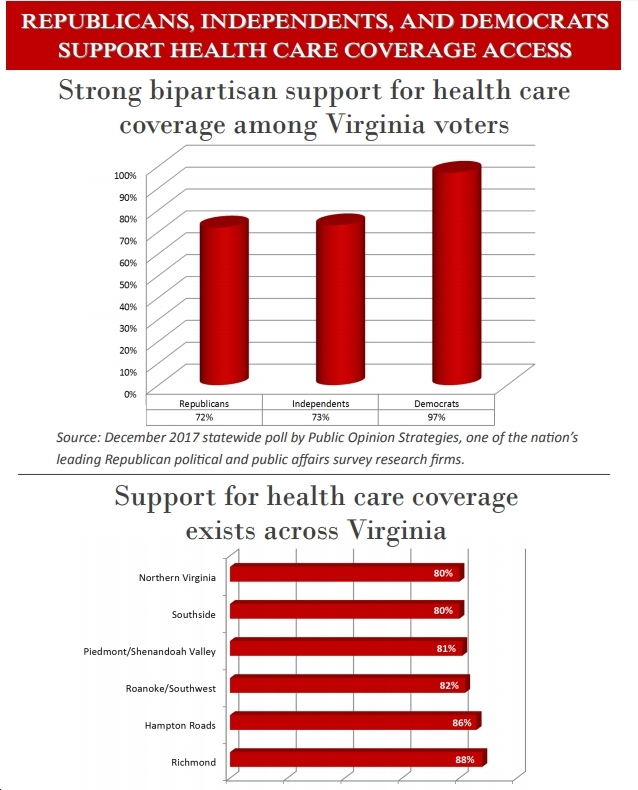 In addition to highlighting the poll numbers, hospital leaders at today’s news conference voiced support for policies that strengthen our health care system such as increased coverage access for our fellow Virginians, continued efforts to improve behavioral health services, and that protect the important role of Virginia’s Certificate of Public Need law in relation to charity care and access to essential services. Speakers at today’s news conference included Michael V. Gentry, Senior Corporate Vice President and Chief Operating Officer for Sentara Healthcare in Norfolk; Mary N. Mannix, President and CEO of Augusta Health in the Shenandoah Valley; Mark H. Merrill, President and CEO of Valley Health System in Winchester; and Dr. Michael McDermott, President and CEO of Mary Washington Healthcare in the Fredericksburg area. A Facebook live video of today’s news conference can be viewed online here. Also today, VHHA released its annual Community Benefit report showing that Virginia’s hospitals provided more than $3.25 billion in total benefit (that includes financial assistance to patients, Medicaid and Medicare losses, subsidized health services provided, hospital-supported community programs, taxes paid, and bad debt expenses absorbed by Virginia hospitals) to Virginia communities in 2016. You can read the full report here. Local hospitals and health systems are economic cornerstones in their communities. They employ nearly 126,000 people, generate roughly $40 billion in economic activity, and support local businesses and vendors. At the same time, Virginia’s community continue to face financial challenges associated with charity care mandates and funding cuts, including growing cuts associated with the Affordable Care Act that intensify the strain of uncompensated care. For example, the Medicare shortfall hospitals face — the shortfall is the difference between Medicare reimbursements and actual costs — rose from $668 million to $909 million from 2015-2016. That is a 36 percent increase in one year. For all these reasons, it is important to support public policy that protects the public health and economic contributions made by Virginia’s community hospitals.